Earlier this year all the members of the DownUnder Inspirations Design Team received a Grand Calibur machine. We've now been using the machine for a number of months so we thought we would share our thoughts on this wonderful cutting machine. 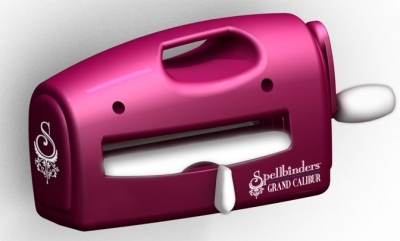 Finally, a Die Cutting and embossing machine that changes everything. The Grand Calibur allows crafters to use up to 8 1/2 “ x 11” paper. The Calibur comes with three plates: The A plate is the base plate, the B plate is the embossing plate, and the C plate in the cutting plate. It also has a large tan embossing mat. The Calibur consists of a plastic exterior but steel internal parts, so no breaking this little baby...and it has suction feet so it won't move when cutting your dies. The first thing I noticed about the Grand Calibur was the size. It’s very sturdy, meaning you don’t need to hold it down with one hand while you crank with the other. One handed operation is most convenient. It has a really wide mouth – you can fit an entire A4 sheet of cardstock on the large plates. For those of us who like to scrapbook in this size, this means we can emboss details anywhere we like on a page. The larger platform also means you can cut with a number of small dies at once to save time. The instructions are basic, and there are little reminder diagrams on the machine itself should the instruction booklet ever get lost. Lastly, there are those beautiful Grand Nestabilities dies that just won’t fit into smaller die cutting machines. All in all, this machine is simply GRAND! For me there are several advantages that the Grand Calibar has over the other leading cutting machines. The most obvious being the A4 cutting plates. This allows you to cut more than one die at a time a bonus when doing Kits, Flowers or any multi cuts. The A4 format also allows you to cut artisan shaped cards, with the large Spellbinder or label dies. this gives your cards a uniqueness and polish you just cant fake. When using the dies that cut and emboss, the Grand Calibar for me, embosses much better than any other in one step. This means you can cut and emboss in one process, usually and do not have to run the die through the machine a second time. You can, and will achieve a deeper emboss, but you don’t have to. This again saves time when doing kits and multiple cuts. When I received my Grand Calibur the thing that impressed me most was the fact that I could now cut much larger sized paper than I had previously been able to with other machines on the market. I love the ease of cutting, with very little effort required to run the dies through the machine. The quality of embossing that can be achieved is fantastic. As you can see from the above reviews we all love the Grand Calibur. For more info or to purchase one for yourself please contact your local craft retailer.